1915 is a year that is often overlooked in the history of the First World War. Sandwiched between the heroic stand of the ‘contemptible little army’ in 1914 and the huge losses suffered by Kitchener’s volunteers on the Somme in 1916, the actions of 1915 have failed to capture the public’s imagination in the same way. The Death of Glory seeks to redress this balance. A rally against Alan Clark’s ‘donkeys’ argument, it looks to refute the aspersions that have so doggedly pervaded since the publication of his infamous book in 1961. Neillands unapologetically focuses on the western front, arguing that 1915 was a pivotal year; contributing to the future direction of the war, testing the army, and helping to develop its tactics. The book concisely summarises the problems the British Army was facing at the beginning of 1915 – with the war only four months old it lacked the manpower, equipment (particularly artillery), ammunition and supplies needed to fight a modern European war; there was tension with the French to take over more of the line and go on the offensive; and there was pressure mounting from the War Office to launch an offensive at Gallipoli. The battle of Neuve Chapelle in early March was the first test of the British Army’s offensive capabilities, with the aim of securing the higher ground of the Aubers Ridge and to prove to the French that the British were willing to take the offensive. Despite numerical superiority and the capture of Neuve Chapelle, the high ground was not taken, and issues with communication, artillery, and delays in exploiting breakthroughs would continue to plague the British on the western front. Neuve Chapelle provided an early indication of critical factors for winning a battle; the importance of an effective preliminary barrage, communication, taking decisive action, and committing reserves quickly to exploit any breakthrough. In the author’s eyes Haig’s preparations for Neuve Chapelle cannot be faulted, and in fact highlights that he was willing to experiment with new tactics and technology, such as utilising the Royal Flying Corps. Neillands goes on to examine each of the subsequent actions on the western front in 1915. He makes it clear from the start of the book that he is no fan of Sir John French, and when looking at Second Ypres is particularly critical of French’s inability to stand up to the French commanders, and his vindictiveness against Smith-Dorrien. Aubers Ridge was fought along same lines as Neuve Chapelle; however the Germans had had ample time and opportunity to strengthen their positions. Whilst Neillands does question Haig’s decision to renew the attack in the afternoon, he places most of the blame for its failure on lack of resources and equipment. The build up to the Battle of Loos is looked at in some detail. The first two days of the Battle are also well-covered, however the narrative ends here; although fighting continued into October, Neillands moves straight on to the events surrounding French’s resignation. Whilst he does criticise Haig for his ‘about turn’ after his early misgivings about an attack in this area, blame for the failures of the attack are placed solely at the feet of French for his handling of the reserves. 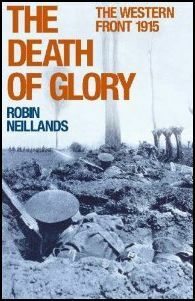 Neillands concludes that whilst the Generals were not entirely blameless and did make mistakes, the ‘donkeys’ argument has no validity; the majority of problems faced in 1915 can be traced back to a lack of pre-war readiness and lack of clarity with the French as to the to the role of the BEF in the war. These factors meant that overall 1915 was a disaster for the British. The book is let down in a couple of key areas. Trying to provide a detailed account of the entire events of one year in a small volume has inherent constraints, and at times the analysis (particularly around Loos) does not do justice to the issues faced. There is also lack of evidence of engagement with primary sources other than the Official History. However, the conduct and outcome of each battle is succinctly summarised and supplemented by clear maps, and overall The Death of Glory provides a useful introduction to the events of 1915.